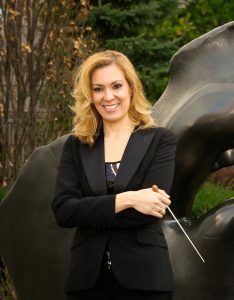 Brazilian-Canadian Danielle Lisboa leads an active career as orchestral conductor, music educator, and scholar, regularly conducting community and professional ensembles. On arriving in Canada in 2008, she became Orchestra Toronto’s first apprentice conductor, named assistant conductor two months later and shortly after appointed the orchestra’s Music Director and Conductor. During her tenure, Lisboa became known for her cutting-edge programming and public engagement, resulting in a steep rise in audience numbers. Her vision and dynamic leadership took Orchestra Toronto into new paths for outreach and youth initiatives, including the Marta Hidy Concerto Competition and the popular annual children’s concerts. In 2013, she was nominated for the Heinz Unger Award for Emerging Canadian Conductors presented by the Ontario Arts Council. Two years later she lead Bellus Barbari, the Toronto Women’s Symphony Orchestra, in its inaugural Ontario tour. Lisboa holds a doctorate in orchestral conducting from the Eastman School of Music University of Rochester and a master’s degree from the University of Houston with special emphasis in opera conducting. For two years, she served as assistant conductor to Peter Jacoby at the Moores Opera House being credit with distinguished operatic performances. She was granted numerous scholarships and awards throughout her career, including the Schissler Conducting Prize and award from the international conducting competition Fundação Oriente held in Portugal. Lisboa began her professional career as a concert pianist. Her academic studies began at Brazil’s largest university, Federal University of Rio de Janeiro, where she founded a chamber orchestra dedicated to promoting music of emerging Brazilian composers. She moved to Edmonton in 2013 to serve as Assistant Professor of Music at Concordia University of Edmonton in the areas of conducting, chamber music, and music theory. Lisboa is former Music Director and co-founder of the Edmonton Metropolitan Orchestra. In the past years, she spearheaded Concordia’s first operatic project, developed a string camp for youth and reinstated the Concordia Symphony Orchestra as a new ensemble in the Fall 2017.